It is pretty ballsy to call yourself “exceptional” but the folks over at Craft Distillers aren’t shy about who they are and what they are doing. And you can’t fault Don Sutcliffe, managing director of Craft Distillers, a 35 year veteran of distilled spirits with Willie Phillips, 23 years managing director of The Macallan for being confident they know their stuff. So what a treat to try two of their early offerings as part of our monsoon malts & more evening in Mumbai. Overall on the palate it kept shifting, sweet, then reveals more, slowly unfurling. This is no harsh grain to go into blending, instead it is nuanced, soft and subtle. In short – most enjoyable. A blend of remarkable aged grain whiskies, including a barrel of 30-year-old from the Carsebridge Distillery, long since closed. Blended by Willie Phillips, formerly of The Macallan; finished in first-fill sherry casks. Subtle, elegant, authentically individual, with great structure. (750ML/43%abv) $100. The most remarkable element are the aromas which are most pleasing and in harmony, even as they shift between different dimensions. However the palate, while exceedingly nice, missed depth and complexity. At least for us with our wee sample. Mature grain whiskey from North British, Strathclyde, and Cameron Bridge distilleries blended with selected barrels of aged, malt whisky from 11 distilleries, including a 30-year-old Macallan. Deep and layered complexity. Superb whisky. (750ML/43%abv) $120. Overall, there was no doubt the grain was our favourite and genuinely stood out. The blended malt was exceedingly good but not quite what we at least would call exceptional – a pity for the range of whiskies that went into its making. Yet it was completely worth the experience and I’m looking forward to future opportunities to see where these gents go with their experiments. 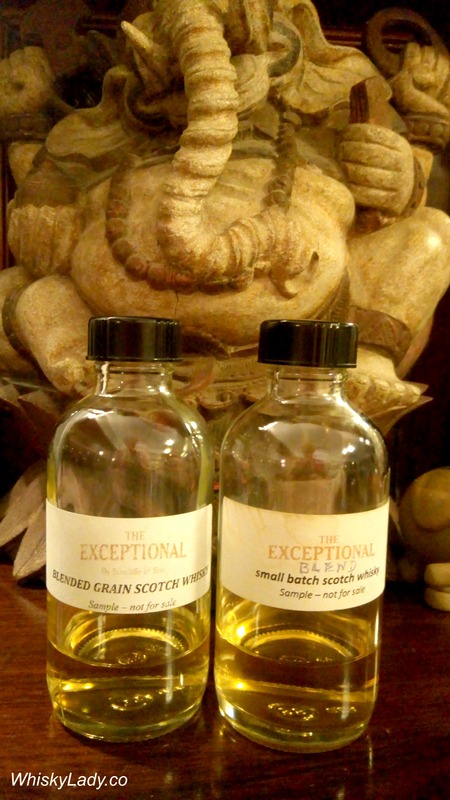 This entry was posted in Blends, Grain, Scotland, Speyside and tagged Blend, Carsebridge Distillery, Grain, Grain whisky, Samples, The Exceptional, The Exceptional Blend, The Exceptional Grain by Carissa Hickling. Bookmark the permalink.